What Do You Use Your Stand Mixer For? You are here: Home / Frugal Living / What Do You Use Your Stand Mixer For? About a week ago, one of my wishes came true. I got a KitchenAid stand mixer. 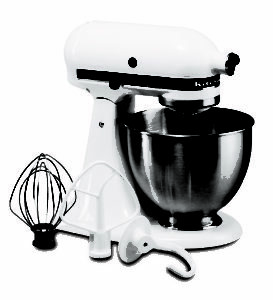 No fancy color or anything (it’s the Classic Plus model), but it comes with a beater, a whisk, and dough hook, and best of all, I got it for FREE using my ginormous stash of credit card rewards points I’d been saving up forever. I plan to use it for the obvious baking tasks – making cookies, cakes and frosting. I’d love to hear what some of your favorite things to make with your stand mixer are. What attachments are must-haves? And please, share any tips or tricks you have for making the most of your stand mixer. Pizza dough! (Or any kind of dough, really.) The dough hook is AWESOME. What I really love about this mixer is you don’t need to babysit it – you can work on other things while it’s running. SO AWESOME. I don’t have any of the other attachments yet. We make a lot of pizza dough, so I’ll definitely have to try it with the dough hook! I use mine for all the standard baking and dough kneading, but using it to shred chicken is by far the coolest I have found. After boiling chicken breasts, use the standard metal beater to shred chicken, it takes less than a minute on medium. I use mine a lot this time of year for chicken to put in soups. I wouldn’t have thought to do that! Thanks for sharing, Kim! Congratulations on your new kitchen toy. I use mine for kneading dough, making quick breads, cookies, whipped cream, creaming butter for herbed butter. Last year I earned credit card points to buy the food grinder and have since been able to make ground chicken, (way cheaper than the grocery prices), and shredded cheese, (though that is a bit clumpy sometimes). Just be careful when you knead dough, my mixer tends to travel a bit while it’s kneading. But otherwise this thing is awesome. Oh, have fun. This is my first time writing to you. I have been reading your posts for about five months and look forward to them daily. You’ve helped me a great deal. Thanks for your kind words, JoAnn! And thanks for the tips! I used to use my food processor for shredding cheese, but maybe I could use the stand mixer instead! I’ve found using the dough hook to knead bread is awesome. Try two minutes on 2 in place of hand kneading. I have a super easy recipe that can be made into French, white or whole wheat that you’d think was from the store-only better! I’ve also used it to make butter. We had our own cow for a while & found it was super easy in the Kitchen Aid. Use the paddle & keep going past whipped cream. Watch it once you start to see little flecks of yellow. It will quickly ball up & slosh out your buttermilk when it’s done so use the shield or drape a towel over the whole thing. Wash the butter in cold water & salt to taste. The butter freezes well & you get buttermilk for baking! Amazing! Never would have thought to make butter! I use mine for baking but have used it to mix in bread crumbs-I was making a huge number of meatballs for a Girl Scout dinner. I use it to make babka dough-with dough hook-my bread never tasted better! I also use same dough to make nut roll/poppy seed roll breads- way faster than kneading by hand! An attachment I love is the grater attachment. I use it primarily for cheese. I buy 5 pound blocks of cheese and grate the whole thing and freeze it in freezer bags. Love that idea! The blocks of cheese are usually cheaper and taste better, too! I’ve had mine for over 20 years! It still works great and I use it constantly. I’ve made butter, breads, pizza dough, but a favorite thing to use it for is with a grating attachment I shred cabbage, peppers, onions etc…for relishes and chow chows (a favorite here in the south) a kitchenaid makes quick work of shredding veggies to can. I love putting up my vegetables from my garden in jars, they are so pretty in my pantry! I have even made salt dough for my grandkids and cinnamon applesauce Christmas ornament dough. (BTW these gingerbread/star ornaments are still smelling good after 15 years!) There are so many uses for your new mixer you are sure to find many new uses that you will be able to share with us.